The illustration above was painted by Beth Zaiken and is on display at the New York State Museum located at the southern end of the Governor Nelson A. Rockefeller Empire State Plaza in Albany New York. Beth was contacted by the museum to create background murals for their long-term Ice Ages Exhibit. The image above is the smaller of the two murals. Beth created these to show extinct species that were endemic to New York during the early part of the ice age (during glacial advance), inhabiting an ecosystem known as glacial or shrub tundra. The habitat is mostly carpeted by grasses and moss with some willow shrubs and punctuated by broken leftover rocks carried by glaciers. 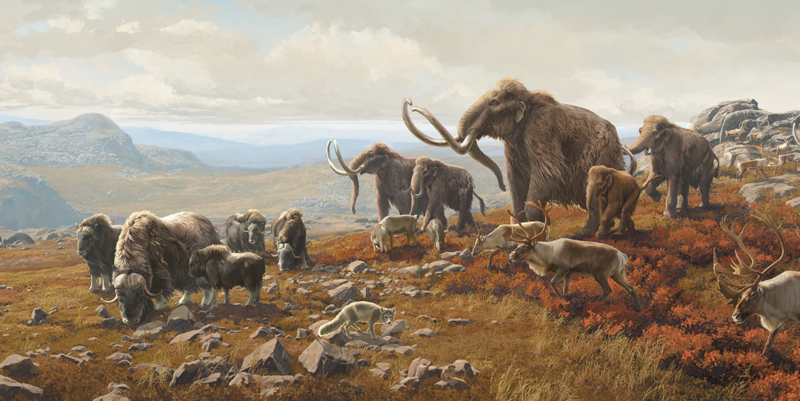 The mural features Woolly Mammoth, Caribou, Muskox, Arctic Fox, and Collared Lemming. The Ingles family were setters living on the New River near modern day Blacksburg Virginia on the northwest side of the Appalachian Mountains. Everything to the west was wilderness and inhabited by indigenous people. The French and Indian War was in full swing. Members of the Shawnee raided the Ingles home in 1855 and twenty-three-year-old Mary Draper Ingles was captured along with four other settlers. She and another woman were taken northwest along the New River, then along the Kewanee River that runs through Charleston West Virginia today later flowing into the Ohio River. They continued along this river past the location where Cincinnati is today. Travelling by boat and on foot Mary and her friend later arrived at a location along the Kentucky and Indiana border where the Shawnee hunted and camped. There was a salt water spring here. Bison and other animals came here to lick salt off the rocks. Mary and the other woman were put to work making salt by boiling down salt water, a commodity the Shawnee used for trade. That fall before winter set in, Mary and the other woman were out gathering berries when an opportunity presented itself to escape on foot with nothing to assist. They felt they would not survive the winter so they took the plunge and set off on foot for home through the wilderness and completed a remarkable 450-mile journey. This is a well-known early and rather remarkable wilderness settler story nicely told in a number of books and articles. What Mary didn’t know at the time was that large mammals had been visiting the the site where they were boiling down salt for thousands of years. The mammals came to graze in the marshy area and lick salt from the stones. Some got stuck, died, and were buried leaving behind a record of a very different world, not that long ago, geologically speaking. Many of those mammals were by today's standards huge, but they didn't exist anymore as they were now extinct. The place today is known as Big Bone Lick State Park. It is located just west of Indiana near the Ohio River in Kentucky and it is generally considered the birthplace of paleontology in America. In 1765 George Croghan heard about and came to the place where large bones had been talked about by the French. It was the place where salt was made, Big Bone Lick, and he was in the middle of collecting bones when he was captured by Shawnee. Unlike Mary he was later released, but of course without the fossils. He was intrigued and very carefully returned in 1767 to collect tusks, large bones, and teeth. Being a colonist of the British empire, like everyone else in America at the time, he naturally provided some of the fossils to the Earl of Shelburne. He also sent a box of what seemed like elephant tusks and some unusual teeth to Benjamin Franklin. At the time Franklin was living in London and it was the knobby teeth he called “grinders” that most sparked his curiosity. The tusks looked like the mammoth tusks from Siberia but the teeth seemed more like something from a carnivore rather than an herbivore. Additional discoveries were made in 1773 and by the time of the American Revolution, the Big Bone Lick site was relatively well known. 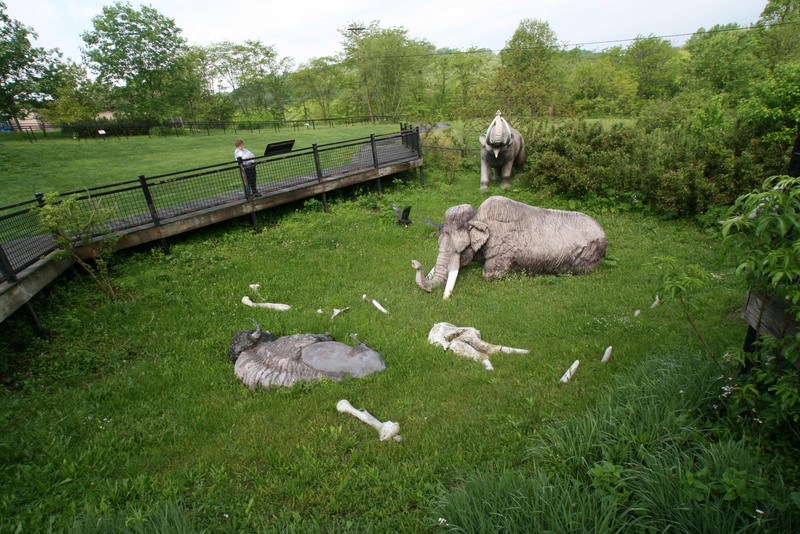 Image of Big Bone Lick Interpretive site taken by myself in the summer of 2013 featuring the types of Pleistocene mammals that periodically became stuck in the mud and perished. This particular image was found in the Mount Vernon Website. Within that website there is a link to an article entitled "George Washington's Mastodon Tooth". The Big Bone Lick site was fairly well known and in 1772 George Washington received a curious tooth from Dr. John Connolly who collected it from the Big Bone Lick site. Washington proudly displayed the tooth in the entryway to Mount Vernon. During the heart of the revolutionary war in 1780, a French delegation made a request to the Continental Congress for information about Virginia. This task was naturally handed off to Thomas Jefferson, the governor of Virginia who took on the assignment when the Continental Army was in its 1780-81 winter encampment. He felt this was important from a number of perspectives and prepared a quite remarkable document entitled “Notes on the State of Virginia”, surprisingly his only published work. The document dealt with laws and politics but it also dealt with flora, mountains, rivers, and fauna. Buffon, the great scientist in France had earlier made statements regarding a superiority of “Old World” flora and fauna, even suggesting “infant America was nature's retardate” implying that when people, animals, and plants arrived from the Old World, they began to decline. Old World was a term used at the time to describe Europe, Africa, and Asia. Jefferson who was well read with a keen interest in science was aware of Buffon’s claims so he used this opportunity to challenge his statements. Inadvertently this task did much to help launch American paleontology. Woolly mammoths were by now well known in scientific circles having been discovered earlier in Siberia and Europe, one still frozen. The similarity of mammoth bones to modern day elephants was obvious and now the bones found at Big Bone Lick were equally curious. The major difference was the teeth that Franklin and others began calling “grinders”. Their bumpy "mountain peak" nature seemed more like the teeth a large carnivore might possess rather a more docile plant eater. It was fascinating to imagine something the size of a mammoth that was so nimble that it could jump out of the trees for an attack. This was something that Jefferson didn’t state but he also didn’t choose to close out the question. Jefferson stated that indigenous stories had made reference to such a beast, a beast that could still be roaming around in the more remote parts of the continent. Eighteen years later in 1799, Georges Cuvier in Paris, the greatest paleontologist of the age, identified the animal with the “grinders” as an herbivore that he named “mastodonte (mastodon), something with some similarities to both a mammoth and an elephant. 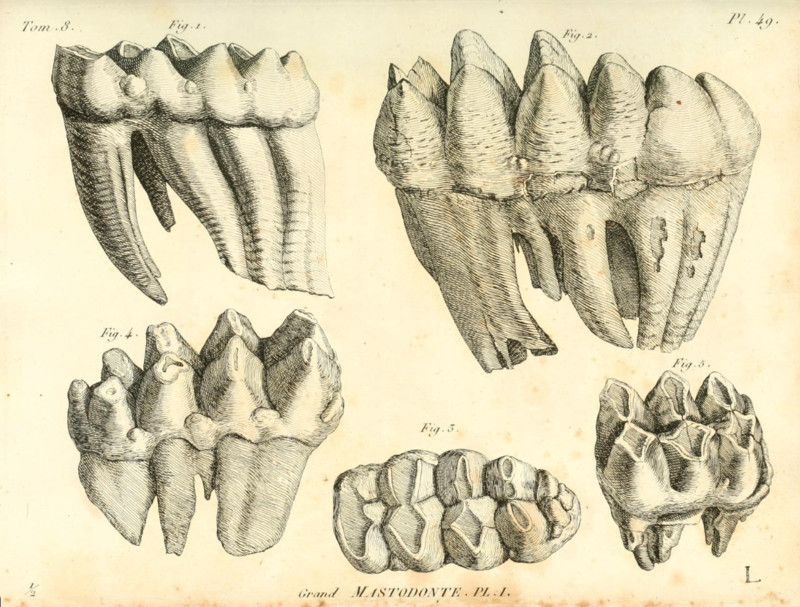 Cuvier explained that the specialized teeth of the mastodon were used for much rougher plant material. It wasn't a ferocious carnivore after all but a relatively docile plant eater. By the 1700’s fossils were being systematically studied in Europe. The great French paleontologist Buffon who later offended Thomas Jefferson, had by 1749 compiled a 44-volume encyclopedia describing everything known at the time about the natural world. Buffon was an observant and inspirational scientist who developed a deep understanding of the biological complexity of the Earth. He was learning to compare one animal to another based on anatomy. Buffon argued that life, just like Earth, had a history; it was not created in an instant and the Earth was older than 6,000 years. Geoffroy St. Hilaire or Geoffroy, who managed to survive the French Reign of Terror, accompanied Napoleon on his 1798 invasion of Egypt and brought back many animal specimens including mummified cats and birds. He was soon appointed to the French Museum d’Histoire Naturelle (Natural History Museum). Geoffroy brought in the naturalist Georges Cuvier and together they substantially stepped up the scientific dialogue of comparative anatomy and paleontology building on the foundation Buffon developed. It was the framework that helped push forward biological research and become a foundation for all later vertebrate paleontology work as well as important for understanding evolution. Cuvier truly elevated vertebrate paleontology to a scientific discipline and is generally thought of as the father of paleontology. Cuvier noticed that fossils were in some layers of the rock record but disappeared in layers above. New ones appeared higher up implying that extinction and biological change had taken place. It was at odds with our collective understanding that everything was created all at once. As he began to notice distinct differences in fossils, change and extinction became obvious. Were there different periods of life on the earth with unique assemblages of fossils? Were some animals destroyed and new ones appeared? In Essay on the Theory of the Earth, Cuvier explained that things we see such as marine fossils on mountain peaks can be understood through rational explanations. About the same time Cuvier was thinking about extinction, the botanist Jean-Baptiste Lamarck was developing expertise while classifying worms, spiders, molluscs, and other boneless creatures (invertebrates) at the natural history museum. He was studying modern animals as well as fossils and he observed subtle changes over time. After careful observation, he determined that animals changed in response to changes in the environment. Lamark felt for example that if an animal had to use certain muscles to survive, the animal would acquire the change. In other words, it would be genetically different at the end of its life than when it was born, something we know now not true. Regardless, it does not diminish Lamark’s discovery that species change does occur. It was a remarkable discovery but it would take scientific observation and a brilliant mind to understand what made it work. Cuvier, Jameson, and Mitchill, Essay on the Theory of the Earth. 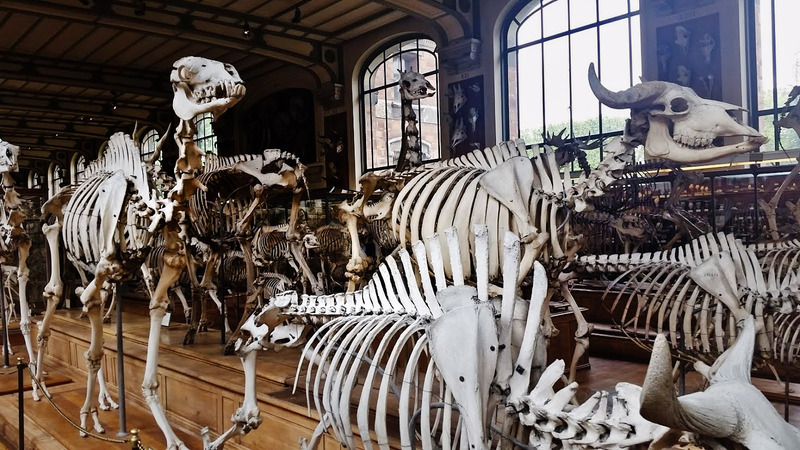 In 2017 I visited the Museum National D'Historie Naturelle in Paris more commonly known as the Cuvier Museum. It is one part of a number of museums and displays just south of the Reign River and just east of Notre Dame Cathedral. The Cuvier Museum is a very special place where European and American scientists including Cope and Marsh spent time. 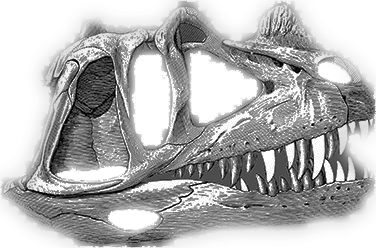 One of the common questions I’ve had when doing dinosaur talks from young and old students alike is “how do scientists look at scattered fossils of a skeleton and understand what they are seeing”? I explain that one aspect of their training is to develop an understanding of the makeup and movement of modern animals and use that knowledge to help them see differences and similarities in fossils, comparative anatomy. Vertebrate paleontologists scrutinize fossil bones figuring how one joined to the next and how the animal moved. A discovery from the floor of a cave in West Virginia today of a peculiarly large claw and long slender limb bones were discovered in 1796. This was three years before Cuvier’s determination that the animal with the “grinders” was a plant eating mastodon. Thomas Jefferson was as much interested in these bones as he was with the grinders because what ever this animal was, it had a great claw. Thomas Jefferson notified the American Philosophical Society in 1796 of the discovery and a year later he presented these bones to the society. He raised the question of whether it might be a lion, tiger, or panther. These bones were far larger than any living animal and it was exciting to imagine something not only huge but ferocious as well. Benjamin Franklin founded the American Philosophical Society in 1743 to promote useful knowledge. By 1780, it was America’s premier scientific organization. Thomas Jefferson had been a member since about the time he started working on the “Notes on the State of Virginia”. These bones are particularly important from an American paleontology standpoint because in response we took a major step forward in vertebrate paleontology. Caspar Wistar who was an outstanding professor of comparative anatomy at the University of Pennsylvania took a keen interest in these bones. Instead of wild speculation he sought out scientific literature that might help. Fortunately, a similar skeleton had been discovered a few years earlier in South America before being transferred to Spain where it was studied in detail. The French comparative anatomist Cuvier compared its bones to other animals including sloths, pangolins (scaly anteaters), and anteaters. Cuvier determined the animal was a sloth and not just an ordinary sized sloth but a giant one. Wistar with excellent anatomical skills of his own, admired the genius of Cuvier and followed his approach. 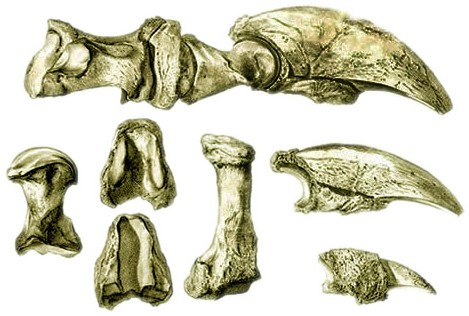 He used a forensic technique to determine that the bones from the cave in Virginia were similar to the that the bones that Cuvier had described as a giant sloth. Wistar presented the bones that Jefferson had early obtained to the philosophical society. 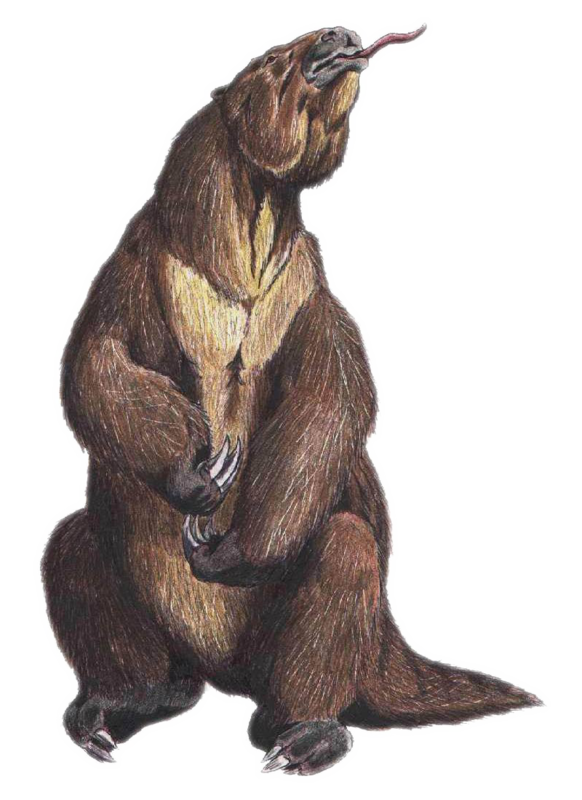 He announced that they were ground sloth, about eight to ten feet tall and weighing about a ton and although unlike the sloths of today that live in trees it was quite the opposite of a lion in most every respect. The technical and comparative anatomy approach of Cuvier was now being used in America by Wistar constituting an important scientific milestone in American paleontology. The bones were an instant sensation, attracting the attention of naturalists in only in America but overseas. When the French master naturalist Cuvier learned about this scientific work he was eager to include notice and illustrations of it in his publications—a notable achievement for a uniquely American animal. About twenty years later the specimen was formally named Megalonyx jeffersonii, in honor of the work that Jefferson had done to collect and present these bones to the philosophical society. Charles Peale opened the Philadelphia Museum to the public on July 18, 1786, our nation's first natural history museum. 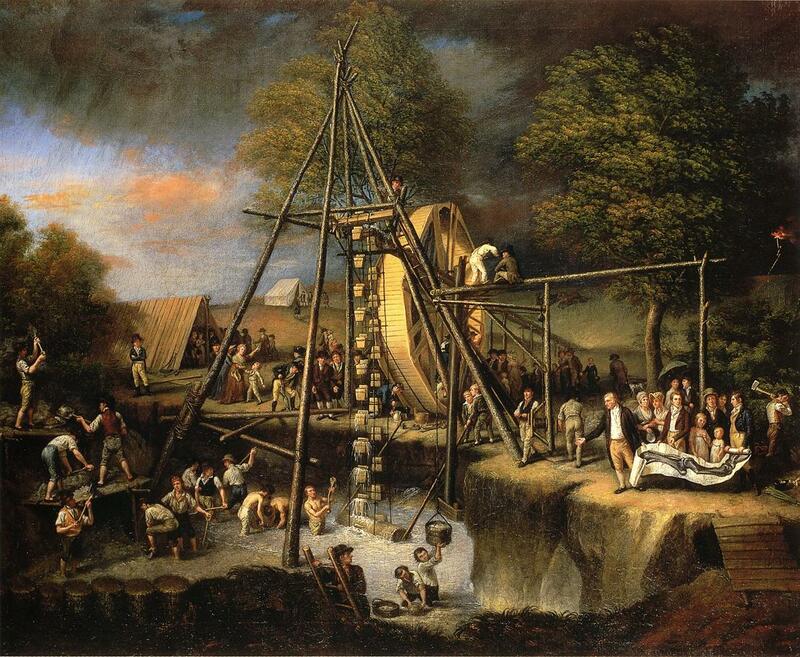 Peale defined the mission; to collect, classify, and exhibit objects of natural history. The museum opened with very good credibility because Peale was already fairly well known and respected. He had a variety of talents, one of which was that he was as an important artist of the American Revolution. Specimens of what looked like the mastodon bones discovered at Big Bone Lick were discovered in a cave north along the Hudson River near Newburgh, N.Y. in 1801. This was not just a few bones but what looked like enough to reconstruct an entire animal. The debate on whether mastodons were mighty carnivores or simple herbivores should have been settled but it was not entirely so these bones might lend some insight. Thomas Jefferson who had just assumed office as the third president of the United States and was also the president of the American Philosophical Society. When the Society decided to fund an excavation of these bones it was only natural that Charles Willson Peale was called in to take charge. Peale took on the assignment and brought along his son Rembrandt as his assistant. Together they excavated an almost complete Mastodon skeleton, then brought the bones back to Philadelphia where they painstakingly prepared and mounted the specimen for display. A Mastodon skeleton, America's first vertebrate paleontology reconstruction, was put on display in the American Philosophical Society main hall on Christmas Eve of 1801. Rembrandt illustrated the excavation of the specimen. In 1815 the Englishman William Smith finished “the map that changed the world”. 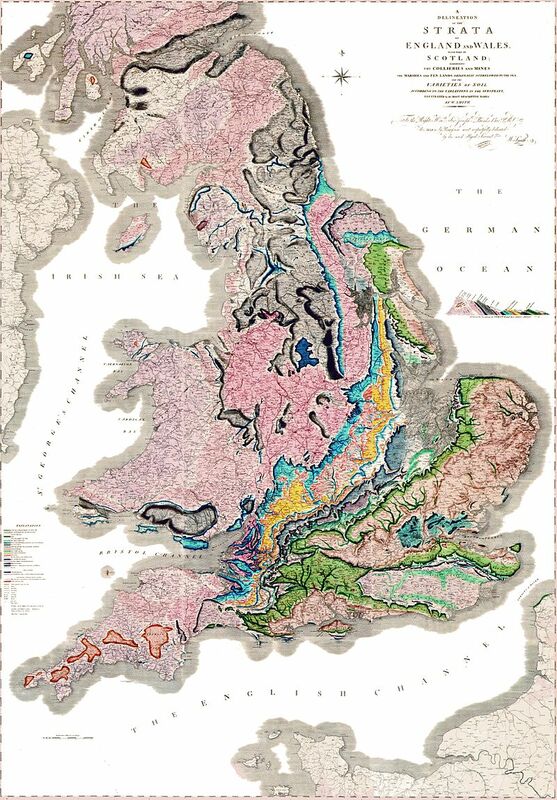 Before anyone realized that such a thing could even be done, he mapped the geology of Great Britain. Before he completed his work, every owner of a coal mine assumed that the rock layers they were seeing in their mine were unique. Years earlier William began noticing that some layers of rock had unique characteristics and the same layer could be found in different mines. He struggled though as many layers of sedimentary rock such as limestone and shale didn't have much of anything that distinguished them from each other. That was true until he started looking at the fossils in them. William began noticing that certain fossils such as ammonites, named for ram's horns, could be distinguished from each other. He also noticed that some ammonites and fossils would not be seen above a certain point in the rock record. William began utilizing the “principle of faunal succession" that is fossils are found in a definite sequence from bottom to top. Fossils were no longer idle curiosities, he could stand on a location where a mine or canal didn't exist and predict what would be found when work began. Oil and gas geologists utilize the principle on a daily basis today looking at small microfossils called foraminifera. What he was discovering was that fossils represent a certain period of time. In the late 1700’s, James Hutton, a Scottish scientist was observing evidence that the Earth was much older than anyone had previously thought and it was perpetually being both built and dismantled. He observed that mountains that had been raised were being eroded with rivers carrying the sediment to the sea. He also noticed that if this erosion continued at the pace he was observing that after a long period of time there would be no mountains at all but they obviously existed. Volcanism and other forces were lifting up older rocks so the earth was somewhat in equilibrium and all this could only happen over a very long period of time. Another Scottish geologist, Sir Charles Lyell, carried this idea forward and amassed evidence that most geological features could be explained by the slow action of present-day forces, such as volcanism, earthquakes, erosion, and sedimentation rather than past catastrophic events. He nicely summarized the concept in the phrase “the present is key to the past”. He helped firm up and popularize the revolutionary work of James Hutton and would go on to become one of the greatest geologists of all time. Lyle is often thought of as the father of geology and his 1839 publication “Principles of Geology” would influence all those that followed him including American geologists and even Charles Darwin. A young English girl who learned to excavate fossils to help support her family after the loss of her father elevated English paleontology to a whole other level. Following the lead her father had taught her, she became one of the world’s first paid professional fossil collectors. 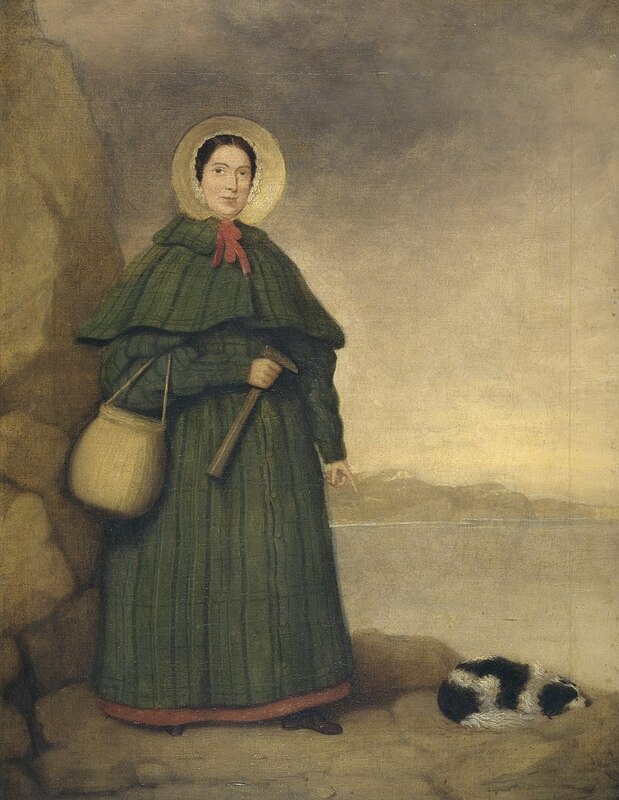 Mary Anning lived in Lyme Regis along the cliffs of the south coast of England. She had a good eye for fossils and could spot something that everyone else walked past. Working in the early Jurassic Blue Lias at Lyme Regis along the southern coast of England, Mary excavated a marine reptile termed an Ichthyosaurus in 1811. About ten years later perhaps her most amazing discovery was named a Plesiosaurus, a very long necked swimming reptile that lived in a shallow sea where England is today about 200 million years ago, a number that no one at the time could have imagined. These were but two of her long her paleontology discoveries in these layers of rock. Following in the footsteps of William Smith, James Hutton, and Charles Lyell, two great scientific figures, Adam Sedgwick and Roderick Murchison, explored the geology of Scotland and England. In 1839 they defined a distinctive fossil assemblage they called the Devonian, named for Devonshire, England. It was the types of fossils that were used to help define the different periods. Murchison later defined another system of rocks that contained different types of fossils that he called Silurian after the Silures, a Celtic tribe living in the Welsh Borderlands at the time of the Romans. Sedgwick later proposed a separate system below the Silurian, while working in Central Wales, that he named Cambrian after Cambria, the Latin name for Wales. The Cambrian, Silurian, and Devonian are periods of time in use still today. By the early 1840's much of the geologic time scale had been developed demonstrating remarkable scientific progress and an understanding of the changes in life over time. JoAnn and I made a trip "across the pond" trip in 2017 to visit Paris, London, and the Jurassic Coast (southern) of England. As a geologist, it would be sacrilegious to go to London and not see “the map that changed the world”, hanging in the stairwell of the Burlington House..
 Winchester, The Map That Changed the World. Early scientists and English nobility came to Lyme Regis and purchased fossils from Mary Anning. The one specimen she found and excavated that astounded scientists was a reptile that swam in the sea and had a very long neck named a Plesiosaur. The Plesiosaur and her earlier discovery of an Ichthyosaur are on display at the British Museum of Natural History. 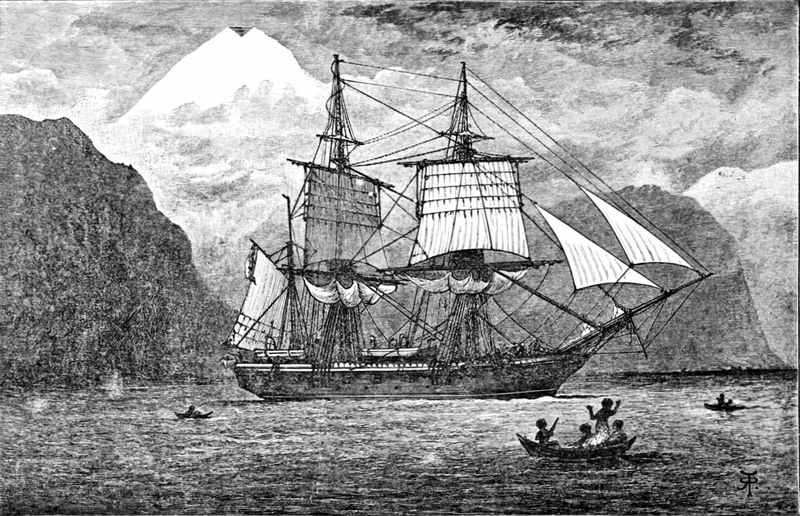 Following the acquisition of the Louisiana Territory in 1803 a decision was made by President Jefferson to fund the first official American expedition to the American West, finding a way across while also seeking out a shipping passage to the Pacific. Lewis and Clark were selected to explore this new land and one of the goals of the Corps of Discovery Expedition was to note, “animals of the country generally not known in the U.S. and the remains and accounting of any which may be deemed rare or extinct.” This seems logical considering President Jefferson’s personal interest in the subject as to whether any of the large mammals, like the mammoth bones that had been found at Big Bone Lick and the caves in West Virginia and New York were still around. Members of the expedition located fossils along the route but only one fossil, a fish, was collected. It was not surprising they didn’t collect more, in fact it was remarkable they themselves even survived this arduous journey. Following Lewis and Clark expedition, Thomas Jefferson sent William Clark and several workers to excavate at the Big Bone Lick site in 1807. Three hundred bones were collected and brought back to Washington D.C. where they were spread out in the East Room of the White House. Jefferson needed help and so he summoned Caspar Wistar, our countries best anatomist, to conduct the analysis. The discoveries included mastodon, deer, bison, and musk-ox. The deer, bison, and musk-ox were much larger species than those today. Jefferson divvied up the collection sending part of it to Cuvier in France, part of it to the American Philosophical Society, and he kept some of it so it could be proudly displayed in the entrance hall at his beloved home, Monticello. The very large bones discovered at Big Bone Lick, the floor of a cave in West Virginia, and a cave in New York, were representative of the Pleistocene Epoch, a time period that began 2,588,000 and ended just 11,700 million years ago. The Pleistocene represents a time period in the Earth when many periods of cooling occurred and great sheets of ice covered parts of the earth. Those portions or time frames of the world not covered in ice would look quite similar to what we see today in natural settings with one exception, the mammals were typically much larger than they are today. In addition to woolly mammoths and mastodons, the land to the south of the ice sheet had a rich variety of very large land mammals including sloths, short faced bears, lions, saber-tooth cats, dire wolves, bison, muskox, beavers, caribou, deer, elk, peccary, and horses to name just a few. Near the tail end of the Pleistocene, some 20-25 thousand years ago and maybe earlier, people began arriving in North America, a moment in time beautifully described by author Craig Childs. It was an amazing, somewhat “Serengeti like” world where humans cooperated to hunt large animals and some predators viewed humans as just another meal. There is just about some evidence of the Pleistocene in every state in fact eight states including Vermont have a Pleistocene mammal as their state fossil. Pleistocene mammals are particularly well illustrated in the La Brea tar pits on Willshire Blvd in Los Angeles. Childs and Gilman, Atlas of a Lost World. William Buckland was a somewhat eccentric English theologian who was not only the Dean of Westminster, he became a geologist and paleontologist. In 1824 Buckland found and described a lower jaw the bone belonged to a giant forty-foot carnivorous land-dwelling reptile he called Megalosaurus. About the same time Gideon Mantell, an English obstetrician inspired by the discoveries of Mary Anning and others, began collecting and studying fossils from quarries in southern England where he lived. In 1822 he discovered teeth that were similar of shape of the teeth to a modern iguana, only much much larger. This triggered three years of research leading to the eventual announcement that it was a thirty-foot land-dwelling herbivorous reptile that he logically named an Iguanodon. 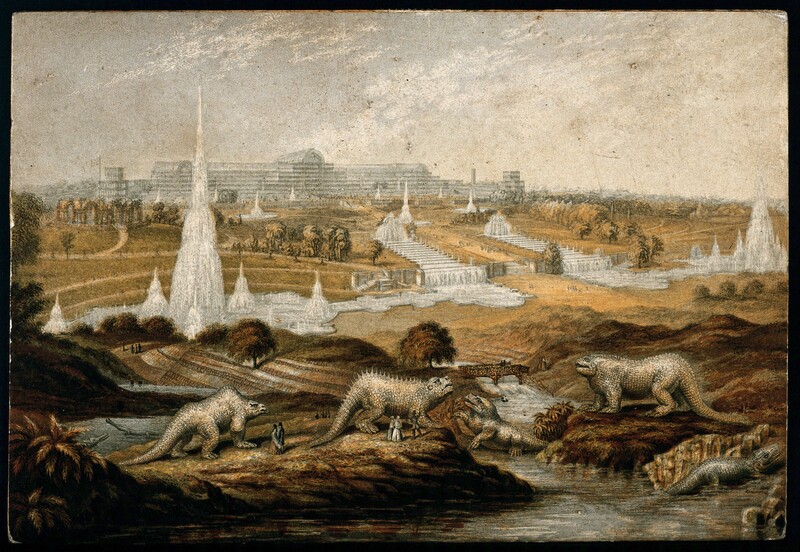 Over time Mantell created a number of publications including an 1831 influential paper entitled "The Geological Age of Reptiles” describing an extended period of time when the earth had teemed with large reptiles. In 1842, Richard Owen by now a well know comparative anatomist had catalogued 13,000 thirteen thousand human and animal anatomical specimens from the Hunterian Collection, a part of the The Royal College of Surgeons in London. Based on his knowledge of anatomy, Owen created a new order of reptiles which he called Dinosauria that now included Megalosaurus, Iguanodon, and a smaller herbivorous dinosaur called Hylaeosaurus. About ten years later these and other models of extinct animals were sculpted by Benjamin Waterhouse Hawkins and under his direction and although scientifically inaccurate by today’s standards, were still remarkable and unveiled to great scientific and public interest at the Great Exhibition in the Crystal Palace in 1854 as the first dinosaur sculptures in the world. These first sculptures are still on display in London today in the Crystal Palace Park representing an important stepping off point for dinosaur paleontology. Charles Darwin completed his remarkable work and the fact that species do change would be tested and retested and reaffirmed over and over again but now the processes that makes this happen are better understood. Darwin felt that evolution was a more gradual continual process over time, somewhat the way Charles Lyell viewed the uniform process with gradual change in geology although we better understand that significant or even catastrophic environmental changes can trigger rapid changes in genetics today. Darwin forecast that new discoveries in the fossil record would shed light on evolution but he could not have imagined how quickly this would occur. Only two years after publication of his book a major transitional fossil had been discovered in a limestone quarry in Bavaria and then sold to the Natural History Museum in London. It was a fossil that Richard Owen would describe as a bird with a long lizard-like tail, bearing feathers, wings equipped with free claws. Archaeopteryx had a full set of teeth, a rather flat breastbone, a long, bony tail, belly ribs, and three claws on the wing all of these more like a dinosaur. On the contrary, its feathers, wings, wishbone, and reduced fingers are characteristics of modern birds. The Bone Wars and America's entry on the center stage of paleontology is just around the corner. Darwin's work and evolution are key motivators in the competition for discovery of new species. Craig, Charles and Gilman, Sarah. Atlas of a Lost World: Travels in Ice Age America, 2018. Cuvier, Georges, Robert Jameson, and Samuel L Mitchill. Essay on the Theory of the Earth. New York: Kirk & Mercein, 1818. Jefferson, Thomas. “Avalon Project - Notes on the State of Virginia.” Education. http://avalon.law.yale.edu. Accessed May 14, 2018. http://avalon.law.yale.edu/18th_century/jeffvir.asp. McLaughlin, Jack. Jefferson and Monticello: The Biography of a Builder. New York: Henry Holt, 1990. Winchester, Simon. The Map That Changed the World: William Smith and the Birth of Modern Geology, 2016. The advancements in paleontology will continue at an escalating pace in America, particularly after the Civil War when manifest destiny kicks western migration into high gear. Great scientific surveys will begin in the West to ascertain what is out there. Joseph Leidy quietly emerges as the father of American paleontology. America's first dinosaur is discovered in New Jersey and it, along with all the other scientific and industrial achievements of our young nation, are proudly displayed at the 1876 Centennial Exposition in Philadelphia. Two scientists, Professor Othniel Marsh of Yale and Professor Edward Cope from Philadelphia emerge during these times. They having amazing intellect and a desire to be first in making new discoveries of previously unknown animals. It is these discoveries that carry America from a scientific backwater to the center stage of paleontology.